Powered by NYX Gaming , is a veteran and a renowned brand name in the online casino world. This gambling company is known for providing quality video slot games with a safe gaming environment. 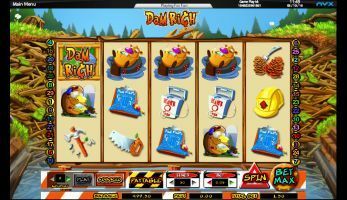 Dam Rich, a highly addictive, cute, non-progressive beaver themed slot game is yet another enthralling treat for online casino players from Inter Casino, developed by Cryptologic. Launched in 2012, Dam Rich has got thumbs up and a positive response from the slot game enthusiasts from across the globe. Dam Rich is a 5 reel video slot game which boasts a total of 30 pay lines. It comes with a scatter symbol, 2 wild symbols, free spin bonus rounds, and an interesting non-progressive jackpot of up to 1,000 coins. It can be played for free and for real money too. From comical animation and smooth gameplay to spectacular graphics, bright colors and fantastic quality audio with catchy sound effects, Dam Rich will have you glued to your seat right from the start. This game is ideal for players who like to chill and rake in winnings. The game aims to help beavers build a dam and of course, make good money. All the symbols of this slot game are centered towards building a dam. You will see 2 beavers, hard hats, hammers, nails, saw, dam plans and conifers. All you need to do is collect as many sticks as you can to accelerate the building of the dam. If you are wondering if this game has both bonus and special features; well, you bet it does. The free spin bonus feature round will make you enjoy Dam Rich slot game even more. It has 2 wild symbols, the normal wild symbol which you will see as a horizontal log and the other which is the vertical log. The vertical log is a hidden expanding wild symbol that falls on any reel and turns all the symbols on that reel into wilds. When the wild symbol completes a winning set of symbols, the rewards you get from that spin is multiplied by the value of the wild symbol multiplier. Both of the wild symbols can show on reels 2, 3, 4 and can also appear in more than one reel at one time. Dam Rich offers 1 scatter symbol that is depicted by a scuba diving beaver. This beaver is highly rewarding for the player and awards you an awesome multiplier that is twice of your winnings total. This beaver only jumps out from reel 3. The free spin bonus round is what all the Dam Rich players wish for. It is highly lucrative. For this you need to score a bonus symbol on reels 1, 3, 5. Once you do, it will trigger the round you have been waiting for anxiously, yes “the free spins round”. Here you can win a maximum of 20 free spins. However, these cannot be retriggered. In this free spins round, you need to collect as many hard hat beavers as you can, they appear concurrently on reels 1 and 5. They jump off to build the dam, so the number of beavers you collect will decide the strength of the dam which will eventually help you earn more bonus credits. Dam Rich is a 30 pay line slot with all the pay lines being activated by default. The bet on every pay line can vary from 1¢ to as high as $10. This makes the total bet per go up to $300. Other Notes on Damn Rich. It also includes auto play and game speed Cryptologic features. We recommend this game for beginners who are new at online casino gambling. This is a non-progressive slot machine thus it spares you from the risk of rolling over your bank account to zero. You can play this game for entertainment as well as make good money with low stakes and small cash outs regularly. It helps you gain experience and expertise in waging into a progressive slot game.